Several species of dandelion are found throughout the temperate regions of Europe, Asia, and South America. The plant is a comparative newcomer to the medicinal repertoire, and was first mentioned in Arabic herbals in the 11th century, as a remedy to increase urination. The root, an effective liver tonic, was not used until much later. 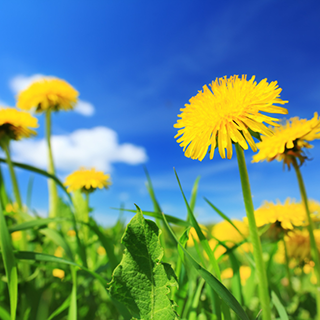 Dandelion is a classic spring tonic that is somewhat laxative, markedly diuretic and improves the function of the liver, promoting secretion of bile. As such, dandelion is an excellent blood-cleanser especially when combined with burdock, helping the the system of accumulated toxins and improving bad skin. Since they also help slow your digestion, they can make you feel full longer, helping you maintain a healthy weight. Put 2–3 tsp (5–10ml) root into 1 cup of water and bring to a boil. Simmer for 10-15 minutes. Drink 1 cup 3 times daily for any condition—such as osteoarthritis, rheumatism, acne, and psoriasis—where liver stimulation and detoxification may help. Make an infusion of 1 cup boiling water over 2 tsp dry leaves. Drink 1 cup 3 times daily to encourage urination in conditions such as cystitis, fluid retention, or high blood pressure. Process the leaves in a juicer and take up to 4 tsp (20ml) 3 times daily as a stronger alternative to the infusion. Take 40 drops–1 tsp (2–5ml) of combined root and leaf tincture 3 times daily to stimulate bile flow, act as a mild laxative, or help dissolve small gallstones. Tolerates a wide range of soils and will grow in full sun or partial shade. Sow the seeds in spring. It self-seeds enthusiastically. The plant is also cultivated for salad leaves in parts of Europe. Gather young leaves for salads in the spring, and the larger leaves in summer for medicinal use. The two-year-old roots are collected in autumn.